A disabled man who was forced to pay to use a wheelchair at Stansted Airport has won his case against Ryanair. Bob Ross said it was discriminatory to be charged an £18 fee because he was unable to walk to the check-in desk. 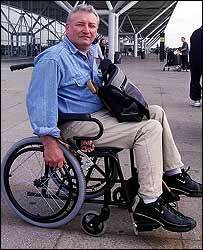 Judge Crawford Lindsay QC ruled Ryanair acted unlawfully by not ensuring a free wheelchair was provided. Ryanair plans to appeal the judgement and says a 50p wheelchair levy will now be imposed on every passenger flying with the company. Mr Ross has had cerebral palsy since birth and later developed arthritis, so walking is very painful. The community worker was awarded £1,336 in compensation. "What I want to see now is for the policy to be changed and the charges dropped, " said Mr Ross from Islington in north London. "I hope that Ryanair will see that it's wrong to charge disabled passengers for the use of wheelchairs and get rid of the charges. "The judge ruled they are breaking the law, therefore I will call on them to change the policy." The compensation award covers the original £36 cost of hiring a wheelchair for his outward and return journeys from London to Perpignan in France, the purchase of a wheelchair by him which cost £300 and £1,000 for injury to his feelings. The Disability Rights Commission took the case against Ryanair to court on Mr Ross's behalf last month. A Ryanair spokesman said: "We have instructed our lawyers to immediately appeal this decision. "We believe the Court of Appeal will find in favour of current EU thinking which is that these costs should be the responsibility of the airport terminal owner and operator." But Disability Rights Commission (DRC) chairman, Bert Massie welcomed the ruling, describing it as "good news for disabled travellers". "It beggars belief that a company with £165.23m annual profits last year, should quibble over meeting the cost of providing disabled people with a wheelchair." The DRC wants Ryanair to pay compensation to 35 disabled people who have complained about paying the wheelchair charge. If no compensation is offered the commission has said it will start a group action against the airline. "We believe airport operators should provide access through their airports free of charge"